Your typical Englishman thinks his home is his castle and woe betide anyone who crosses him! An Englishman’s garden, however is something else. Most men cut the lawn and leave the other stuff to the wife but occasionally you see the odd man weeding, mostly they like growing vegetables and flowers for showing. The English love their gardens and take great pride in having a postage stamp size lawn with flower beds either side at the front of their houses. Back gardens, or yards as you may call them, are more for fruit and veg and maybe a greenhouse. Sitting out in the garden is something that does not come easily to most British people and BBQ’s, whilst gaining in popularity, are still not the first thing that comes to mind when we see a bit of sunshine. My own garden is a bit different to the norm: I do not have a front garden as such, because we have a long driveway and that has flower beds on either side but there is no lawn at the front, no, that is round the back. 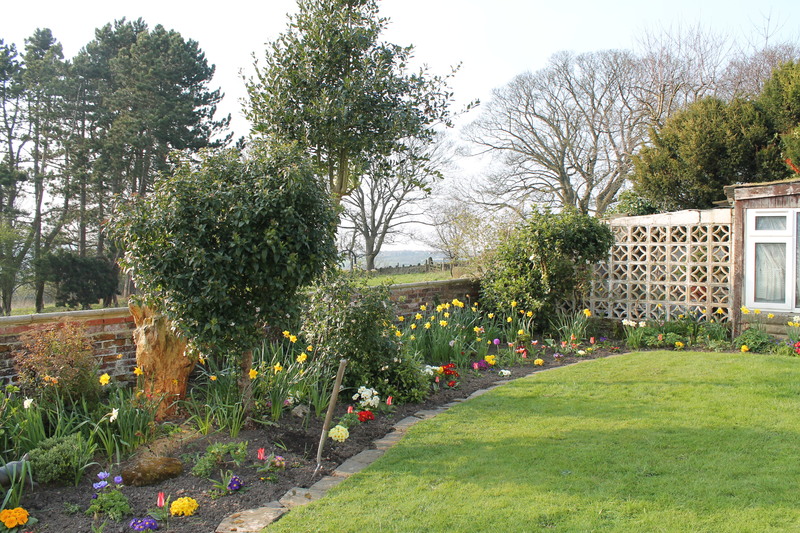 The back garden has a lawn and flower beds, a greenhouse, and spectacular views of the distant moorland. When I moved here in 1999, the lawn was there but a bit tired looking, and the flowers beds a bit bare – but the view was great. 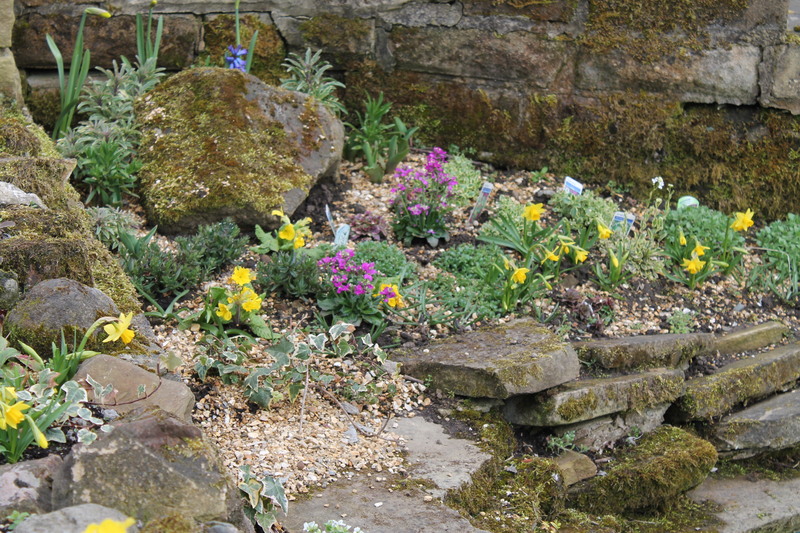 Since then I have tried to re-vamp the garden somewhat and now we have a beautiful lawn with full flowers beds, a small pond at the base of a rockery, one or two huts, and a greenhouse where I can bring seedlings on. It has been a labour of love for me and also my friend Erica who has helped a lot this year. 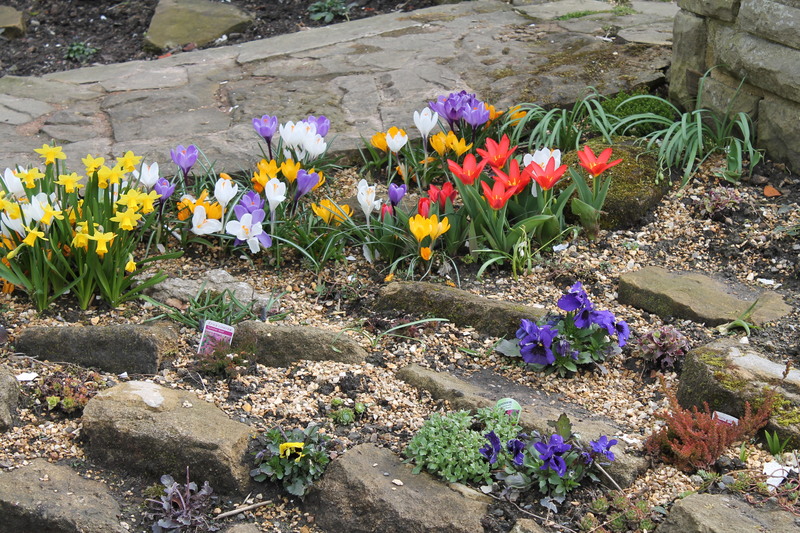 Spring has now arrived here and we have so many bulbs in flower that the garden is awash with colour! I have quite a few seedlings coming on for the Summer months so I will keep you all up-to-date on progress in my very English garden. Editor’s Note: We carry two English Garden teapots. Julia, would you take these out to the garden for tea? Sabrina, we love our blogger. This is her world – her garden than she and her family and friends work on – and we pay her to share it with us. I am sorry you do not agree. You right in that I will not leave this here because it would be hurtful to her. She is a very sweet woman. But you are wrong in that I won’t publish it because it’s negative. We do publish negative. Just not hurtful to people. Thank you for your opinion, and glad you enjoyed the laugh.